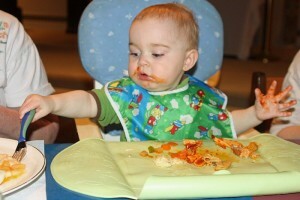 OSWEGO, NY – 19-month-old Keaton Davis of Pennellville samples some food from his great-grandmother’s plate on Wednesday. The youngster was at the Church of the Resurrection in Oswego for the annual Lenten lunch. He was there with his mother, Melissa Davis, and great-grandmother, Rose Garlic, all from Pennellville. They had a large menu selection featuring salads, pasta, sweet potatoes, fish cakes, pies, cakes, fudge and much more.